You happen to have the new brand identity PDF? I'd like to add the logos to the site. They didn't release one. They're relaunching their site Monday so you may need to wait for then. All I can say is they better not get rid of the Viking horns on the helmets. Thanks for pointing that out. What has been seen cannot be unseen, and now I'll never be able to enjoy this logo. Although, realistically...it's not that enjoyable of a logo to begin with. Didn't they once have a helmet with more traditional horns? Btw, does that logo wrap around at all? I know they used to have a helmet with a logo that wrapped around and the two sides came close to touching in the back. Reminds me a little bit of the team called "Diesel" on the old Maddenteams.com site. They wore green and grey. I believe the helmet the dude designed had logos that wrapped all the way around and met in the back. 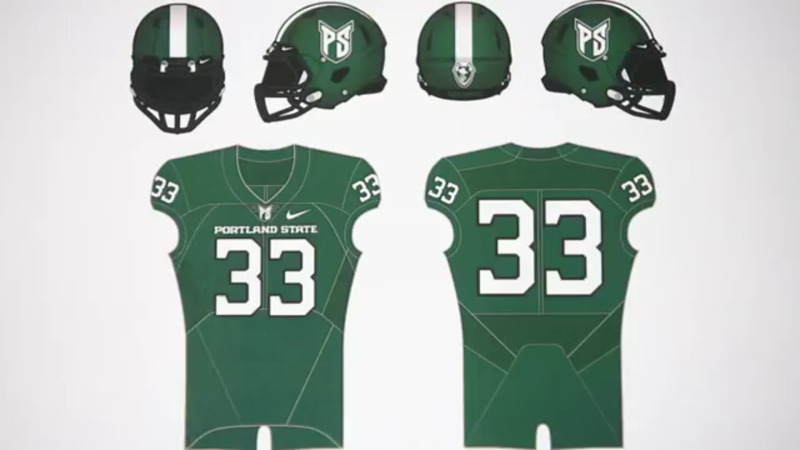 But I also know that Portland State used to have helmet logos that came close to meeting in the back (but still didn't quite). I don't remember that one with traditional horns, but I do remember the wrap-around, I think. And I can't forget the odd spear helmet that was even used in TeamBuilder. edit: mghelmets.com doesn't seem to have the wrap-around helmet, nor the traditional horns. Never mind, I think that was it. The logos wrap around to the back kind of like the Minnesota Vikings' horns do: not all the way, but most of the way. Obviously an upgrade over their old identity, but it's far from perfect. The PS shield has issues, as others have pointed out, and the Viking logo kinda looks like the head is mounted on a plaque. I like the Viking head, but it would be so much better without that shield/boat frame thing. Kinda gives the negative space more of a hull feel, though. That's the only possible reason why they did it that way. Here's the Diesel team from Maddenteams.com. Definitely some similarities to the old Portland State visual identity. Not only are they getting rid of that logo, which I've always liked and felt wasn't used properly, but they're using the inferior PS monogram logo as the primary mark on the helmet. The far superior Viking logo will be at the back of the helmet, at the tail end of the helmet stripe. Good effort on this one. The uniforms are certainly an improvement. 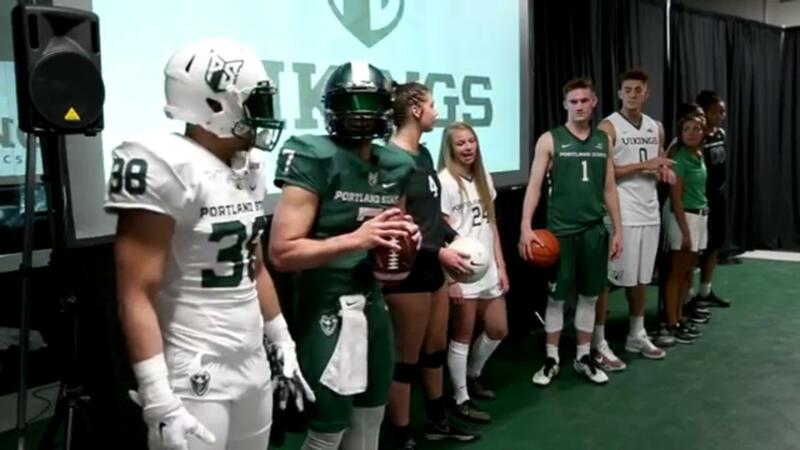 But I don't think come close to making a lasting brand for Portland State . Not only are they getting ride of that logo, which I've always liked and felt wasn't used properly, but they're using the inferior PS monogram logo as the primary mark on the headlines. The far superior Viking logo will be at the back of the helmet, at the tail end of the helmet stripe. Do you have a pic of their new helmet? Yech. I agree that the jerseys aren't too bad, and the Viking at the end of the stripe is decent, but the PS logo does NOT belong on the side of a helmet. Thanks for posting the uniform graphic, btw. I guess this means that the pants are green, also. That's too bad. The pants should be white. The helmet is outstanding. That monogram looks great on there. The Viking face would have been good as a helmet logo, as well. But the letter logo in the shield is dynamite as a helmet logo. (It will also look beautiful as a cap logo.) And then there's the nice solid white stripe, which is fortunately free of the tapering that has marred so many helmet stripes. Usually you and I disagree, but I agree with a lot of what you just said. 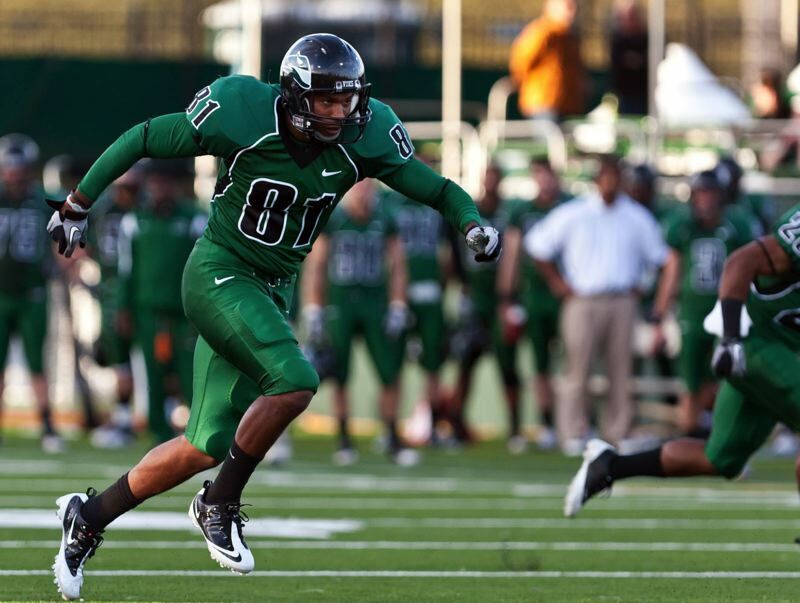 The pants should be white, and tapered helmet stripes are generally stupid-looking. The PS logo is a good logo for a hat, as well. I just don't think it's really up to snuff as a helmet logo. Maybe it'll grow on me. They've got both a white and green option, it looks like.